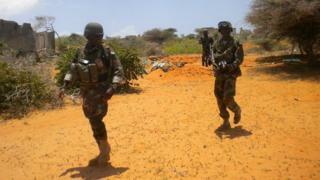 Image caption Amisom troops have been deployed to hunt for al-Shabab fighters in southern Somalia. Picture: Dominic Hurst, BBC News. When I saw the trenches and foxholes used by al-Shabab fighters on the front line just north of Kismayo, the war taking place inside Somalia suddenly became very real. I've always known that al-Shabab was an army as well as a radical group capable of the most extreme acts of terror - but here was the evidence of its military side before my eyes. A series of scrape holes stretched across a broad front, littered with the recent detritus of fighting men - bullet casings, empty soda bottles and the odd scrap of uniform. I was on the front line between al-Shabab and forces from the African Union's Mission in Somalia (Amisom), accompanying the Bravo combat team of the Sierra Leone army. I crossed from African-Union held Kismayo, which until a year ago was an al-Shabab stronghold, 10km (six miles) north to the village of Gobweyn, which is where the militants now launch their attacks from. The day had begun with Bravo team's Lieutenant Joseph Adekule briefing a room of 50 fighting men - commandos, snipers, drivers, radio operators and medics. They all listened intently, staring hard at an old, flattened cardboard box that served as an operational map. Objectives were clearly marked and coloured arrows showed the planned movement. The cardboard map may have been unusual, but when the men climbed into their South African-made Mamba armoured cars to start the operation, they were well drilled and efficient. Once in the vehicles, they prayed. Whether Christian or Muslim, they all recited the Lord's Prayer in English followed, in Arabic, by some verses from the Koran. Their first objective was an abandoned old hotel about 5km (three miles) north of Kismayo. When we got close, Lt Adekule deployed three men to search the blackened and crumbling building. I stood next to the lieutenant, taking cover next to a vicious thorn bush, as he directed operations. "They used to use this location," Lt Adekule said, in a voice that combined staccato military with lyrical West African tones. African Union troops regularly engage with al-Shabab militants in southern Somalia. "We pushed them back, but at night they sometimes try to come here again and shoot at our positions back at the old airport." From inside the abandoned hotel, I heard his men shouting: "Room clear, room clear." We continued up the road on foot, the tall young lieutenant barking orders into his walkie-talkie as he jogged up the road. The second objective on the way to the village of Gobweyn was what Lt Adekule called "the old air force base". There were hardly any buildings left standing. This was where I saw the network of trenches and foxholes. Lt Adekule identified them as the militants' dugout positions. "We've pushed them back and we try to dominate the area by patrols. But we don't have enough men to occupy everywhere, so they sometimes manage to come back to shoot at us from these dugouts," he said. As we drove towards Gobweyn, one of the men in the lead Mamba armoured vehicle said he saw people running away with AK-47 rifles in their hands. A corporal travelling alongside me said something similar. "Look - over there," he shouted, prodding and pointing. "They're running away over there." I didn't see the men, but their presence appeared to be confirmed by what we found later when we reached the village. and found it eerily silent and inactive - not at all like a normal African settlement. We also spotted several overturned, bright yellow plastic jerry cans next to a puddle of water. Somalis don't abandon their water carriers - one of their most precious possessions in a drought-hit land - unless they have a very good reason. I do not know if these water gatherers fled because they saw the gunmen or the Amisom troops, but it added to the air of tension. Most people in the village declined to talk and moved slowly away from the soldiers and the BBC team, perhaps due to the flak jackets and helmets we were wearing, but one man seemed happy to speak. I asked him if what Amisom had told me - that Gobweyn was full of al-Shabab militants - was true? "Al-Shabab are everywhere," he said. "They're in Kismayo, they're in Mogadishu, and look what happened in Nairobi - they're there too." It wasn't clear if this was meant to be a statement of fact, or a boast, or a way of saying something without getting himself into trouble. But a shiver ran down my spine when someone else privately whispered to us: "Al-Shabab were here. And they will be back. So we cannot say a word."